Brenna Malmberg from Houzz gives us an update on inspiring bathroom remodels. In 2017, we featured lots of inspiring bathroom remodels, but it was the small bathroom transformations that really had us saying wow. Many times, we could hardly believe it was the same space. Let’s take a look at nine bathroom makeovers that happened within 60 square feet or less. Maybe these will inspire you to overhaul your small bathroom in 2018. Before. Even accounting for the fact that this reference photo was snapped without a flash, the dark finish on the walls and countertops made the bathroom feel small and cramped. Laura Hay DECOR & DESIGN Inc.
After. A new color palette made all the difference, making the space feel light, airy and downright delightful. The client didn’t want an all-white bathroom, so designer Laura Hay chose whites that had a more warm, limestone look. 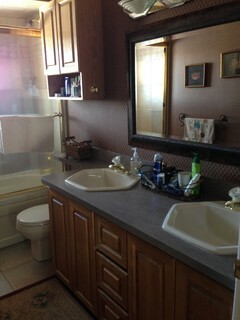 Other than the color, the family also updated the windows, vanity, sink, tub-shower combo and mirror.